Former WBO World Champion CHRIS ALGIERI, and his promoter, Star Boxing CEO, JOE DEGUARDIA will have the honor of being guest speakers at the next Ring 8 meeting on November 20th. Ring 8is a nonprofit organization located in New York City, founded in 1954, in an effort to assist former professional boxers in need of financial support, including housing and medical care. Joe DeGuardia has had the privilege of speaking at Ring 8 many times in the past, even being honored by the organization in 2015 as the Ring 8 Promoter of the Year. Chris Algieri is also a veteran of the prolific group, having been honored as the Ring 8 Fighter of the year during their 28th annual Holiday Awards event in 2014. Algieri is set to make his return to the ring for the first time since April of 2016, and will be doing so in none other than the renowned Star Boxing venue. The Paramount, in Huntington, Chris’ hometown. Algieri, an eight fight veteran at the venue, returns with only one thing in mind, a second world title run. The anticipation of “Rockin’ Fights” on November 30th has been unrivaled, as not only Long Island, but the boxing world has been abuzz since the announcement of Algieri’s return last month. As expected “Rockin’ Fights” 33 has officially sold out. Algieri’s homecoming on November 30th will be in front of a packed house, busting at the seams to get a glimpse of the hometown hero, Chris Algieri, back in action. 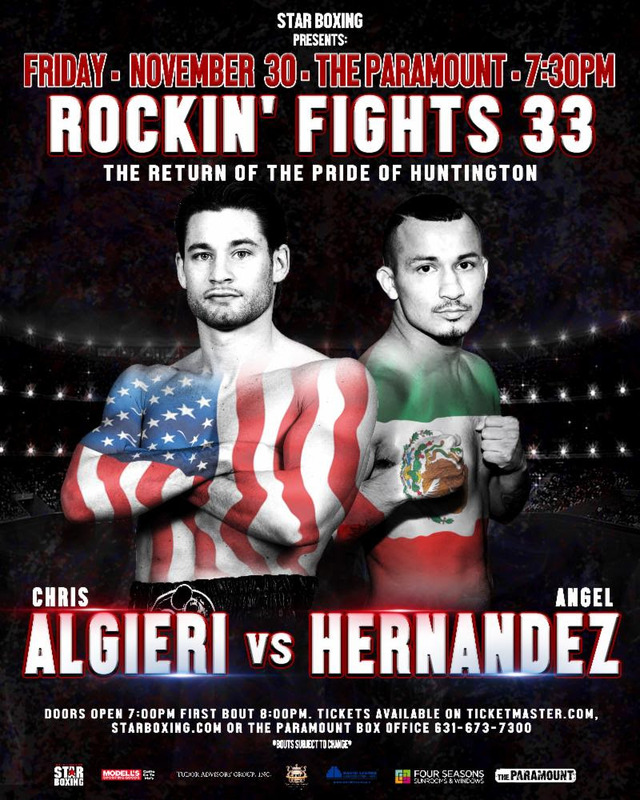 If you missed out on your chance to be a part of the momentous “Rockin’ Fights” 33, The Return of Chris Algieri, Star Boxing will be back at The Paramount, with the critically acclaimed series, “Rockin’ Fights” on February 22nd and tickets can be purchasedHERE . Star Boxing also plans to kick off 2019 with a bang, as another edition of the fantastic “SLUGFEST at the SUN” series is set to take pace at Mohegan Sun on January 26th. Tickets for this event to be available soon.